Second choice for the most useful power-tool for plastic work lies between the saw and the lathe. The three types of saws — circular, band and jig, all have their advantages and disadvantages. The circular saw will cut a line that is straight automatically, whereas the others will not, but it requires an abnormally high speed and heats up rapidly. The band-saw will not heat so easily as it has a greater length in which to cool off, will cut more rapidly, will cut a vertically straight line, and will make outside curves. Any type of circular saw may be used, from the 4" size on up, but there is considerable work to be done in sawing cylinders which have a diameter of 3" and over. Practically any type of medium or fine-toothed blade can be used, wood - or metal-cutting, a happy medium being an ordinary cross-cut blade. The teeth on a jeweler's slotting saw or the "milling cutter" type of saw are too fine and will clog and heat, and in addition they have no "set". A slight set for clearance is desirable. Woodworking blades do not last very long, but can very quickly be brought back into even better shape than originally with a few file-passes across each tooth, with the file held on a direct line with the diameter-line of the blade, removing the "rake" entirely. (See Figure 4). Another type of blade which works very well is the one designed for cutting soft metals such as brass. These stand up longer, and can also be sharpened. The fastest sawing of all is done commercially by a machine called a "cut-off", which is actually a saw using a coarse thin resin-bond abrasive wheel, but these cannot be run without provisions for a stream of water playing directly on the cutting-point. These machines can saw through a solid 4" bar almost as quickly as you can cut a slice of bread. The best all-round sawing method for a moderate amount of work is a band-saw, using the flexible hack-saw type of blade, although ordinary woodworking blades can also be used, but will not stand up quite as long. The hack-saw type of blade will stand up for several thousand cuts, works cool, throws the dust down, and makes a cut that is straight vertically. The wider the blade used, the straighter will be the line cut horizontally, as a narrow blade "wanders" off the line quite easily in this material. A 3/8%" to 1/2" blade is about the best size. The jig-saw calls for no particular comment—it is only suitable for jig-saw work, and medium-fine blades should be used. Files, sanding-sticks and felt-covered buffing and polishing sticks can also be used to great advantage in the jig-saw, for finishing sharply irregular contours, inside and outside. The only other type of power saw—the power hack-saw— has no place in a plastics shop, as the material is soft enough to be worked with any woodworking equipment, and a hack-saw would be a waste of time (except of course a hand hack-saw). Any type or size of lathe, wood—or metal-working, can be used on plastics, provided it has provisions for fairly high speeds for polishing. Tools, accessories and chucking devices in common use are suitable, and these with a few accessories which can be easily made up will enable the craftsman to perform practically any operation done by commercial plants. 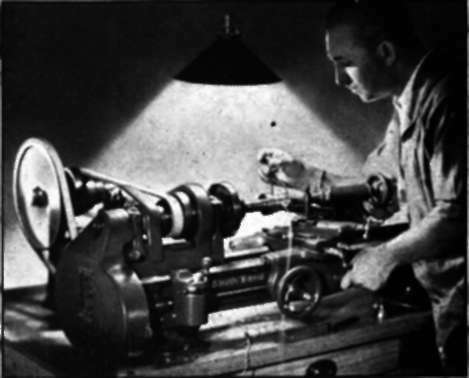 The ordinary small wood-turning lathes on the market for around five dollars or so perform very satisfactorily for most operations on cylinder and sheet, although for handling rods and small tubes a four-jaw independent chuck or a three-jaw scroll chuck are practically a necessity. The cylinders are mounted on a wooden mandrel driven by the spur center (construction explained in a later chapter), the sheet stock is worked by gluing it to the face-plate. Rods and small tubes however must be chucked, as the spur center would chew them up too badly. The regular tail-center can be used, but a hardened 60-degree metal-working center will stand up better. Ordinary wood-working chisels can be used for occasional jobs, although they will require frequent re-grinding. For faster or heavier work, high-speed tool steel bits or the new Stellite bits mounted in suitable handles, would give better service. 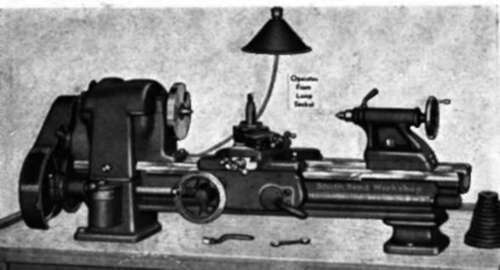 Any size wood-working lathe with reasonably good bearings and capable of being driven at from 1000 to 3000 R.P.M. can be used on plastics. Much more accurate and rapid work can of course be done with metal-working lathes having a power feed. Two popular types of these lathes are illustrated in Plates I, J, K. Speeds required on these lathes are not as great, there is less heating and less sanding required. A fairly high speed is still needed for the buffing and polishing operations however. PLATES I, J, K. Two popular makes of the better grade of school and home workshop screw-cutting lathes ideal equipment for working cast resin plastics. Ordinary high-speed steel tool bits are satisfactory for ordinary work, but for production work, stellite or other special alloys will stand up longer before requiring a new edge. It might be mentioned in passing that interesting results have been achieved with hard bronze tools, chisels and carving cutters on plastics. This is principally due to the fact that they dissipate the heat so much more rapidly than steel does. While steel blades, drill - and tool-bits work very satisfactorily on plastics, this material "does something" mysterious to steel edges I don't know that it has ever been satisfactorily explained. It is softer than copper, yet it will kill an edge quicker than tool-steel. For that reason a power grinding-wheel should always be kept set up near the lathe, to re-edge the points from time to time. Brass or bronze bits can of course be sharpened in the lathe with a file. Another important piece of power-tool equipment is a drill-press, of any type or size. Ordinary drill-bits are used, fly-cutters or any other common drill-press accessories, the only adaptation necessary being that the edges of all but the smaller drill-points should be "backed off" a little, as for use with brass, by grinding the edge so that it has no rake. Another great saver of elbow-grease in the way of power equipment is a sanding-disc or sanding-belt, or even a wooden drum covered with sandpaper and mounted between centers in the lathe. These are most useful for shaping, when used with coarse sandpaper, or for finishing, when using fine sandpaper. Every surface of a piece of plastics must be fine-sanded before buffing, and this becomes quite tiresome when done by hand if it is a large surface, whereas with power it is the work of a moment. Any grade of coarse paper for shaping, and fine (#6-0 to #8-0), preferably garnet wet-dry is used. There are two or three methods of doing very acceptable carving in plastics. The simplest is merely by using a triangular file, and working on convex surfaces, such as the outside of a bracelet, ring, etc. On flat sheets, carving with hand-tools can be done with a tool something like an engraver's point, with a squarer end than is usual when working copper. For production work in carving plastics however, power tools are needed. One of the handiest devices in this line is one of the small electric hand-grinders now on the market, which weighs only a few ounces, gives speeds of over 10,000 R.P.M., and is fitted with dozens of different-shaped points, cutters and gadgets. This type is strongly recommended for fine carving. Two popular types of these tools are shown in action in Plates 2A and 2B, and some of the various cutters in Figure 11. To do any real fine, smooth carving, speeds of at least 2000 R.P.M. and up to 10,000 R.P.M. are absolutely necessary, the lower speeds being possible with the larger-diameter cutters, which however, cannot be used to make such short turns or to work on flat stock. Professional carving equipment consists of a heavy and rather expensive ball-bearing horizontal spindle, fitted with various arbors and different types of steel cutters. Some of these are small, others up to 2". The spindle naked sells for about twenty-five dollars, the arbors and cutters for a dollar to three or four dollars each. They are very finely balanced and travel at very high speeds, driven by a quarter-horsepower motor. A battery of these in operation is shown in Plate 2W. 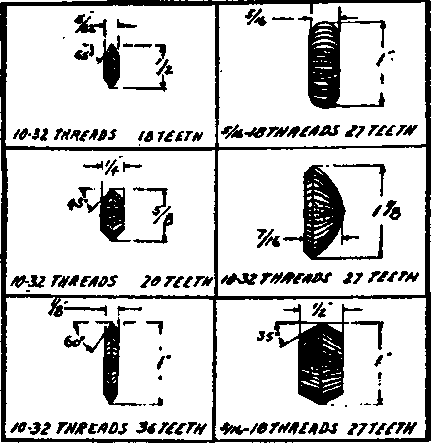 and a close-up in Plate M. Figure 2 shows a few of the many types of cutters available. Fig. 2. A few of the many types of carving cutters available for professional equipment. PLATE M. (Above) Close-up view of professional plastic-carving equipment. The toothed cutter shown revolves at a very high speed, and cutters are available in a great variety* of shapes. (Below) Amateur power equipment for carving plastics. A high-speed hand electric grinder, carving the base of the Chinese Lamp described in Project No. 27. A very acceptable substitute can be rigged up in the home workshop however, if your lathe has good bearings and can stand these speeds without excess vibration. If it shows bad vibration at these speeds it will eventually walk off the bench, bolts and all, and if it is a very good lathe, but has plain bearings, it would be a crime to drive it at this speed. If your lathe is good enough, or bad enough to stand it, as the case may be, you will find a description of arbors and carving cutters that can be easily made by the craftsman will be found in Chapter 4. A certain amount of carving can be done with a set of small coarse-grained grinding-wheels, which, because every grain of abrasive corresponds to a tooth in a carving-cutter, do not have to be driven at such a high speed. Even taps, countersinks and similar tools can be used. Tumbling-Barrel The only other piece of power-driven equipment which would be especially useful in a shop working on plastics would be a tumbling-barrel, and then only if a considerable quantity of relatively small pieces were to be finished. A description of an easily-made tumbling-barrel will be found in a later chapter. School Equipment The average school woodworking shop already contains all the equipment really necessary for making practically anything in plastics, in the proper proportions, lacking only a few special supplies. Only one band-saw is needed, as the material comes in long pieces, which are usually cut up and distributed by the instructor. More work is done and more time spent at the lathe than at any other machine, and most school shops have more lathes than anything else. 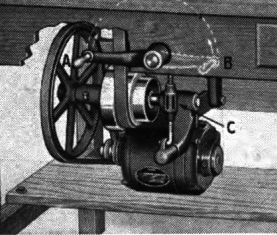 It might become necessary to set up an extra buffing-head or two, but these are fairly inexpensive, and it might be possible to arrange for each lathe to have an arbor which could be run onto the head-spindle, on which the buffs could be mounted. 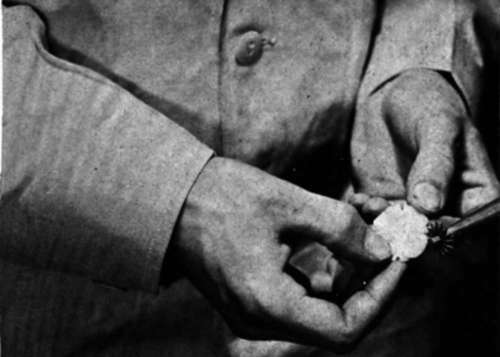 There would also probably be a line waiting to use the grind-stone or emery-wheel, if the shop has only one. Otherwise, no additional equipment is needed except the following supplies: not usually found in the average woodworking shop.